What is the stability of the APHA/Pt-Co/Hazen liquid color standards? Our industrial experience is that if kept properly stoppered in amber bottles, the APHA/Pt-Co/Hazen visual color standards do not degrade significantly for longer than 2 years but this is the time frame that most sources reference as optimal. If you have a dated APHA/Pt-Co/Hazen 500 liquid color standard, one validation method would be to see if it still meets the absorbance tolerance limits of ASTM D1209 Table 1, and is effectively clear (ASTM D1003 Haze% < 2). Scharf, W. W., Ferber, K. H., and White, R. G., “Stability of Platinum-Cobalt Color Standards,” Materials Research and Standards, Vol. 6, No 6, June 1966 pp 302-304. Hazen, A. A new color standard for natural waters, American Chemist Journal (14:300), 1892. Hazen, A. The measurement of the colors of natural waters, American Chemist Journal (18:264), 1896. 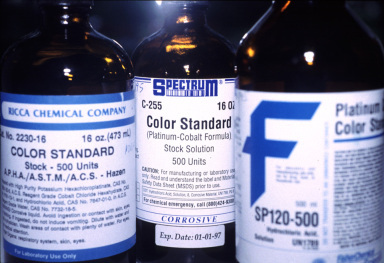 ISO 2211:1973 Liquid chemical products – Measurement of colour in Hazen units (platinum cobalt scale) is an ISO method that references both Hazen and platinum cobalt color and was subsequently replaced by DIN EN ISO 6271.